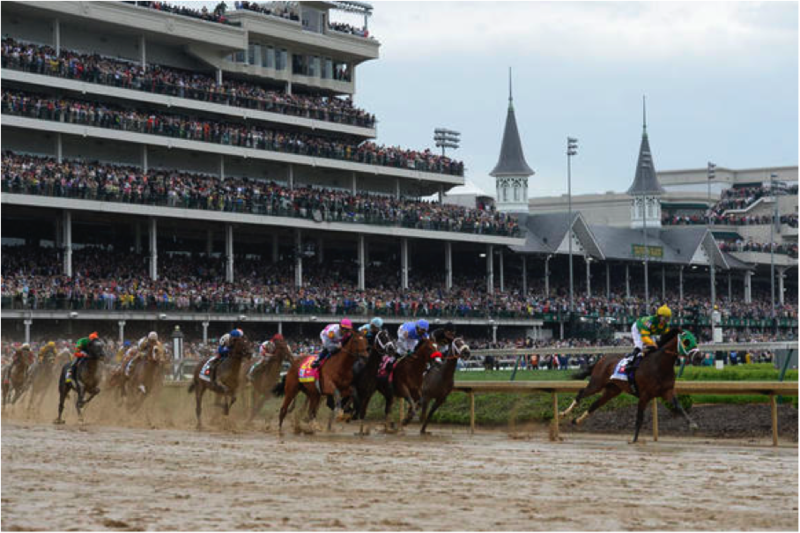 The 140th running of the Kentucky Derby, also known as the greatest two minutes in sports, may get even greater this Saturday, May 3, with a win from local hero California Chrome. The three-year-old chestnut colt is looking to become the first California-bred horse to win the Kentucky Derby since 1962. California Chrome trains just five miles away from Cal State Long Beach at Los Alamitos Race Course on Katella Avenue. The horse is truly a hometown hero. He won the Santa Anita Derby by a colossal margin on April 5th at Santa Anita Park—“the great race place”—located in Arcadia, California. Trained by 77-year-old Art Sherman and ridden by jockey Victor Espinoza, California Chrome is this year’s favorite to win the Kentucky Derby after stellar wins at Santa Anita. Espinoza won the Derby in 2002 aboard War Emblem and will try it again this Saturday aboard California Chrome. The jockey threw out the opening pitch last month at an exhibition game between the Angels and Dodgers. Standing next to the mighty Mike Trout and Yasiel Puig, the petite jockey looked like a modern-day David amongst two Goliaths. This Saturday, Espinoza has a chance to look just as mighty as the most imposing major league baseball player, if he crosses the finish line first aboard California Chrome. Though the horse looks just as grand as his Derby competitors, his humble beginnings here in California make him a biblical David among 19 other Goliath-like horses. Born in the Central Valley, California Chrome had a modest beginning to his racing career. His bloodlines are not as rich compared to the kingly bloodlines of other horses in the Derby. He finished second in his first race at Hollywood Park in Inglewood, California, to a horse named Time for a Hug. Since then, California Chrome has fired off four straight wins, earning many hugs along the way from his trainer, jockey, and proud owners. It will take more than hugs, however, to get this horse into the Kentucky Derby winner’s circle the first Saturday in May. Before a bed of roses can be draped over the horse’s back, he will have to overcome the mile and a quarter race—a difficult feat for many horses. So whether Cal State Long Beach students have their money on the local hero California Chrome, or a major longshot, this Saturday’s running of the Kentucky Derby will yield excitement, and support for a horse that can potentially bring back a historical win to “the beach” from the bluegrass state.